This year we celebrate 14 years since we started SASCWA. SASCWA is a small grass roots charitable organisation inaugurated in 2005 by a group of individuals from South Australia working in public health. 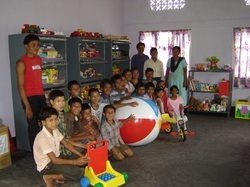 Inspired by the People's Health Movement , our first project was to set up a toy library in the village of Dhemai situated about 40 km southeast of Guwahati, the capital of Assam. Our choice of Assam was based on two members of the group, our project officers, Udoy and Rupali Saikia, having come from Assam. We knew that a project in Assam would have the support of the Saikia family who continue to live in Assam and that the regular visits by Udoy and Rupali to the area would allow us to monitor and evaluate the project.We thought that it was very important to ensure that our efforts were beneficial, sustained and appropriate for the local villages with whom we would be working. Our efforts in Dhemai brought us to the attention of Uttam Teron, a dedicated individual who with his family has built the 'Parijat Academy' from four students to the several hundred taught there today. We were able to provide support for Parijat in particular through the provision of text books, locally sourced desks and benches and bedding for the boarders from remote villages. In order to get schooling children from remote villages without schools were required to board at the school. With the help of Uttam Teron we set up and supported schools in three remote villages. Two years ago these were amalgamated into a single school at Garbhanga to improve the conditions for the teachers, to ensure that the project was sustainable and so that school was maintained even if a teacher was sick. A hostel to house ten students from the two neighbouring villages was set up. Currently we have 52 students in the school. Assam is in the north-east of India. It is one of the seven states which make up the seven sisters which are connected to the larger landmass by a thin strip of land. Assam has hundreds of tribal communities. Most of these live in very poor conditions with no clean protected water supply , no electricity and no local health facilities. The children have little access to health care and in those communities which have them, the schools are poorly equipped. Many villages have no schools at all and literacy rates are low. Infant and child mortality is high. Nearly 7 of every 100 children die in infancy. The people who live in these villages live by growing crops and working in the fields.